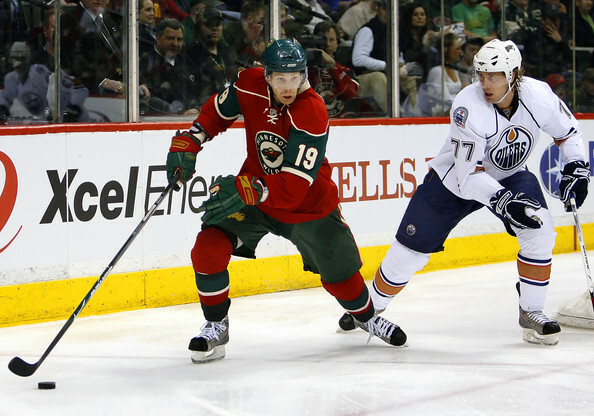 Just over a week away from the Iowa Wild’s home-opener at Wells Fargo Arena, there have been many last minute moves from Iowa’s NHL affiliate, the Minnesota Wild. With the final roster yet to be released, fans have undoubtedly been wondering which players are going to take on leadership roles. New players and new fans will need someone to guide the team in its first year after moving from Houston. Mentioned in my last post, the team’s former captain, Drew Bagnall, and assistant captain, David McIntyre, both left during the offseason, leaving the team with a vacancy in major leadership roles. More assistant captain leaders that won’t be joining Iowa this season are Marco Scandella, who has been called up to Minnesota, and Paul Mara, who has virtually disappeared after the end of last season. With so many losses, the team needs new experienced players to step up and take leadership of the new Iowa Wild. Despite the losses of some iconic figures to the franchise, there are still some familiar faces that will be there to kick off the first season in Iowa. Having worn the “A” in Houston last season, both Carson McMillan and Chad Rau are experienced leaders that have been with the franchise for nearly five years. Each is reliable, both having played most of the 76 games in the 2012-2013 season, and Chad Rau is also highly regarded for his accountability on the ice which gathered only six penalty minutes during that time. Both McMillan and Rau were refined to be better leaders in their last season and will likely be a good and influential presence to new incoming players. But McMillan and Rau are just the start of the list of players that can be expected to lead the new team. Recently reassigned to Iowa, Stephane Veilleux and Jake Dowell are seasoned veterans with years of NHL experience and are likely to take on major leadership roles. Both Veilleux and Dowell are known for being dynamic voices in the locker room and for their physical play styles. For players looking to refine their game, these two will be great role models and will share their years of expertise to help the team overall. And with each having their fair share of fighting experience (Fight Card: Veilleux, Fight Card: Dowell), they can be expected to step up and help protect the younger, more vulnerable players on the team. Some more recent members to the franchise may also bring some leadership to Iowa. Last year’s addition of Brian Connelly boded well for the team defensively given his previous five year AHL history. Though small in stature, his experience and style of play will make him one of the few leaders on the defensive line. And the returning Warren Peters will also be joining the team in Iowa after his year away with the Wilkes-Barre/Scranton Penguins. Peters, like Connelly, brings tons of AHL experience – nearly decade’s worth – that will be useful as he knows how the system works and understands many of the rival teams’ playing styles. Leadership is everywhere, whether it is from familiar franchise faces, seasoned veterans, or recent but experienced additions. Despite some offseason losses of former leaders, the newly formed Iowa Wild still has a multitude of players ready to help guide the team with their years of experience. Incoming young players, forwards and defensemen, will have many role models to look up to for guidance from the very beginning of the new season.